Eleanor Roosevelt's In My Garage, by Candace Fleming, illustrated by Mark Fearing (Schwartz & Wade, September 2018) , is just the sort of entertaining time travel story the title suggests. Nolan and his little sister Olive have had experience with time travel--they just hosted Ben Franklin for a visit (Ben Franklin's in my Bathroom). 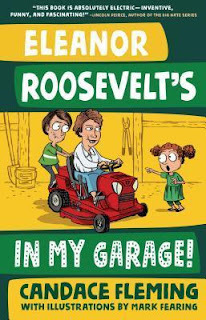 Now the strange device that brought Ben forward in time, and took him home again, has done it again, and Eleanor Roosevelt shows up in their suburban Illinois home. And just a little while later, she's joined by her family dog, little Fala. Eleanor is, of course, a strong minded, level-headed sort of person, and she believes the kids when they assure her she'll get home safely. But the device doesn't work automatically--some positive change has to be made by the time travelling visitor. When Eleanor finds the local park is going to be made into a parking lot, she rallies the kids to the cause of saving it. And though the locals aren't easily swayed to oppose the mayor's plan, Nolan and Olive rise to the occasion. I loved the portrayal of Eleanor--she is just the determined, smart, brave sort of person that I imagine she would be if she found her self in the 21st century (although she's not all that curious about modern times, which is perhaps a wise choice). Nolan isn't a particularly heroic or interesting kid, but his good-hearted and does his best. Olive is a total brat, and I couldn't stand her efforts to be winsomely cute and get her own way all the time. Fala is lots of fun. It's not a preachy book--it's point is not life lessons, but rather to entertain while perhaps instructing a little. Short graphic stories flash back to Eleanor's own time, from her girlhood trauma of being constantly put down by her mother, to the time she and her husband entertained the King and Queen of England in true American style. The author's note at the end expends on the bits of history offered in the story. So it's not at all necessary to know anything about her to enjoy the story, but by the end of it it's hard to imagine readers not admiring her! This sounds like a terrific concept for a time-travel book. Thanks for telling me about it. I will look for it.